MightVine tomatoes are already in Chicago stores including Whole Foods. 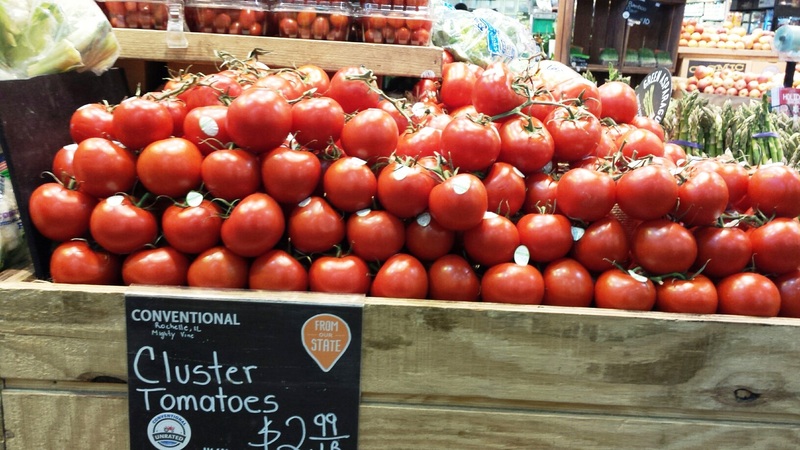 In recent weeks, Chicago shoppers have found something unusual in Whole Foods and Jewel stores--local tomatoes, in November. They come from an experiment in Midwest farming underway 80 miles to the west in Rochelle, IL. That’s where the new MightyVine hydroponic farm houses 100,000 tomato plants inside a 7-acre greenhouse. The vines wind around wires and rise high into the air like magical beanstalks sprouting chubby red fruit. The tomatoes are being used and sold in specialty store Local Foods in Chicago’s West Town neighborhood and in school food catered by Handcut Foods. Both are co-owned by Jim Murphy, who serves as chairman at MightyVine. “What we’re trying to do is provide the best tomato possible into the city of Chicago,” Murphy said at the farm’s opening last month. Hydroponic and greenhouse tomatoes from places like Maine and Canada have been available to Chicagoans for years now. But Murphy, MightyVine CEO Gary Lazarski and their investors have put a $11 million bet that Chicagoans will prefer a product grown closer to home. The Dutch have developed a lot of hydroponic farming, so it’s little surprise that MightyVine has chosen Nic Helderman as its master grower. We recently toured the farm with the Netherlands native and he explained that the plants only need about 10 percent of the water used for field tomatoes. Most of that water, he says, will be derived from captured rainwater and snow melt. On the other hand, the farm will need some extra inputs when it comes to heat and light the vast greenhouse While the diffused glass ceiling lets in sunlight, the plants will also depend on high-power sodium lights that give the room an unearthly glow. Helderman is optimistic about the conditions for a strong, consistent crop, despite a disastrous whitefly infestation that struck in late 2013 at one of the major hydroponic tomato facilities in Maine, Backyard Farms. According to CEO Lazarski, the farm has created about 35 permanent jobs and 15 seasonal jobs in Rochelle. MightyVine officials say they hope to grow about 4.5 million pounds of tomatoes a year at the facility (about 70,000 to 100,000 pounds a week), including some specialty varieties custom grown for Chicago restaurants including Frontera, RPM Steak, Bang Bang Pie Shop and Revolution Brewing. In stores, the tomatoes will go for $2.50 to $3.50 a pound.